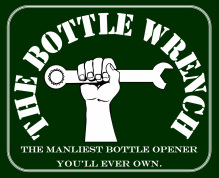 Want to get your own Bottle Wrench? If you're ready to hold the manliest bottle opener ever created click a beautiful picture below and we'll send you one A.S.A.P. All of our orders are routed through Etsy.com so you know you're safe and we offer our 100% satisfaction guarantee. Go ahead, throw down that sissy plastic bottle opener it’s time to become a man.